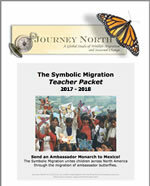 The Symbolic Migration unites children across North America through the migration of ambassador butterflies. Welcome to the Symbolic Migration 2018-2019! This fall join 60,000 students across the globe to create symbolic monarch butterflies and send them to Mexico. Children who live beside the monarchs' winter sanctuaries in Mexico protect the paper butterflies and return them in the spring. 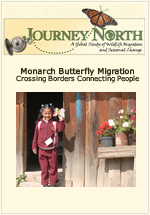 Through the Symbolic Migration, children are united by the monarch butterfly and celebrate its spectacular migration. They learn authentic lessons of conservation and international cooperation. The symbolic butterflies' fall flight is timed to correspond with the real monarchs' journey south. As the eastern population of North American monarchs are arriving in Mexico for the winter, students from the sanctuary region receive their symbolic butterflies. Sometime in March when the real monarchs' departure from Mexico is announced, the paper butterflies return north carrying special messages from the students in Mexico. The annual migration of millions of monarchs across North America is among the world's most spectacular natural events. Countries across the globe must cooperate to protect the monarch butterfly. Your participation represents international support for the monarch.